Just a couple months before Birmingham was incorporated in December of 1871, Chicago experienced one of the worst fires in US history. 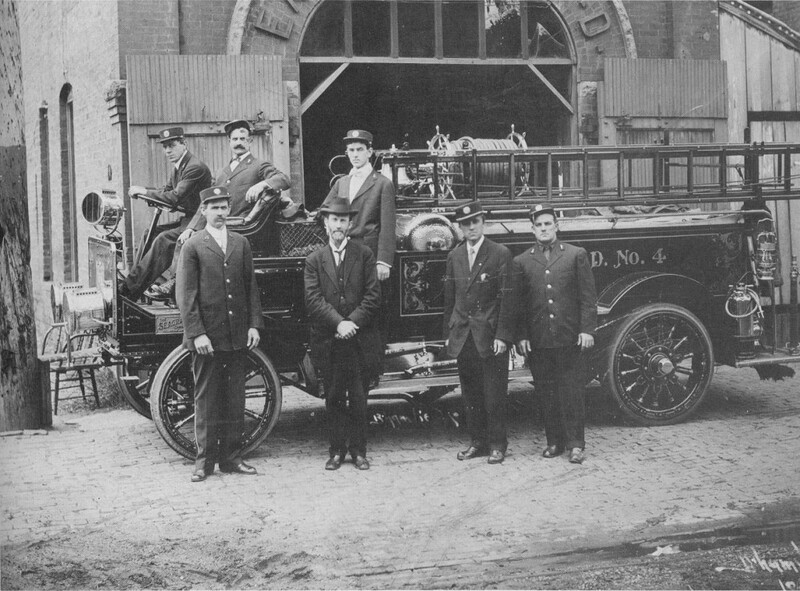 Fire departments were created and modernized all over the country as a result, and the new city of Birmingham was no exception. 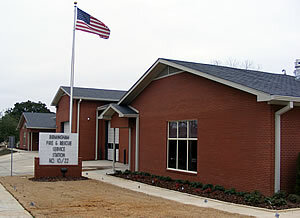 As the city grew, numerous new fire stations were built to serve the expanding population and geography. 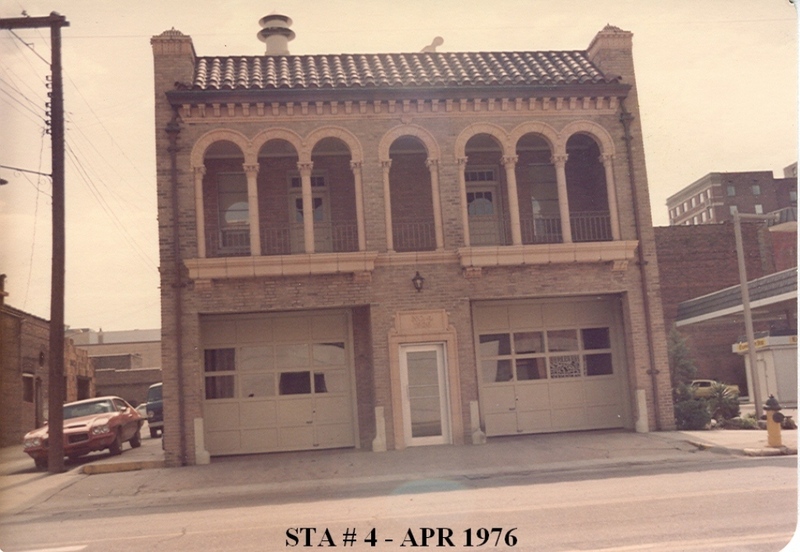 Fire Station No.4 (seen here in 2 historic photos courtesy of Birmingham Firefighters Local 117; click on their link to visit a fascinating site) is located right up 24th Street behind my office, between 2nd and 3rd Avenues North. The older photo with the engine shows the original station designed to serve the “East End” of Birmingham; the newer and current version, pictured in 1976, was built in 1926 and decommissioned around 1980. Renovated as architectural offices in the early 1980’s, it was recently sold and the new owner, Sheppard-Harris and Associates, has moved a small accounting firm into the building. The exciting news is that Connie Harris, principal of the firm, is committed to a thorough exterior renovation. We have designed this renovation, and it should be starting any day now. The brick will be cleaned; the 1960’s replacement windows will come out and new, double-hung windows will come in; all trim will be repainted; an illuminated projecting sign will be hung; and doors will be refinished. Oh, and bright red awnings will hang over the front windows, to recall the bright red engines that used to be visible inside. Now, the even better news: Connie only needs a small portion of the space for her company. She is open to renovating the rest of the interior into…retail? Apartments? More office space? The sky’s the limit, as long as it makes sense. As part of that Phase 2 renovation, we’d love to take out the front windows and replace them with overhead doors reminiscent of the original Fire House doors–do I see a sidewalk cafe, or a garden shop, or a sculpture gallery? Perhaps. By the way, those are actually window boxes under the gorgeous arches, and my friend Randy McDaniel, landscape architect, is selecting some new plants. I will post some “after” pics now that we’ve all seen the “before.” One last note–fire stations have traditionally been focal points of civic pride. There’s a reason Birmingham spent the money on Station No. 4 with its Italian Renaissance detailing and classic proportions. Unfortunately, that same sense of civic pride is missing in many recent public buildings, and fire stations are no exception. One of the most baffling buildings erected recently here is Fire Station No. 10/22 in Avondale (on Fifth Avenue South) that, despite its location in an old neighborhood filled with great architecture, is a very, very bad suburban-ranch-style mess. Hopefully the renovation of No. 4 will take a little of the sting out of the affront over at No. 10/22. In the meantime, here’s hoping the firemen in all our stations have quiet days playing cards and saving cats from trees! This entry was posted in Uncategorized and tagged Avondale, Fire Station, Great Chicago Fire, Sheppard Harris. Bookmark the permalink. I’ve always loved that former fire station on 24th Street. Can’t wait to see how you’ll transform it. Thanks to the second floor gallery, that station has been high on my list of downtown buildings I’d love to live in. (The Empire Building is #1.) So apartments might be a good option for the extra space. Of course, once you get the overhead doors in, the first floor would make a fantastic fresh produce market. Charles–I’ve always loved it too. The second floor porch is spectacular. What is your opinion of the lack of parking? Would you or someone else be willing to live upstairs if you parked in a leased lot down the street? number of options. Installing glass paneled rollup doors would really be cool. If an apartment is in its future, I would not see any problem with renting space in a parking deck down the street. It is pretty much the “norm” in larger citys, such as New York. As a matter of fact, we have no parking at our building on 20th Street. We keep our cars parked in the deck at our office, 2 blocks away. I guess it would depend on how far away the leased lot was, but the lack of immediate parking shouldn’t be a problem. Southside is full of examples of apartments that don’t have parking outside their front doors, and people keep moving in, so it doesn’t seem to be a deterrent. Besides, if a short walk to the car gets you the best porch in downtown Birmingham, I’d say it’s a good tradeoff. If we’re talking about renovating old stations, we should take a close look at Fire Station No. 10 in Avondale and No. 22 in Forest Park. Those two were left vacant when the new one was built. One very beautiful adaptive reuse is the former Fire Station No. 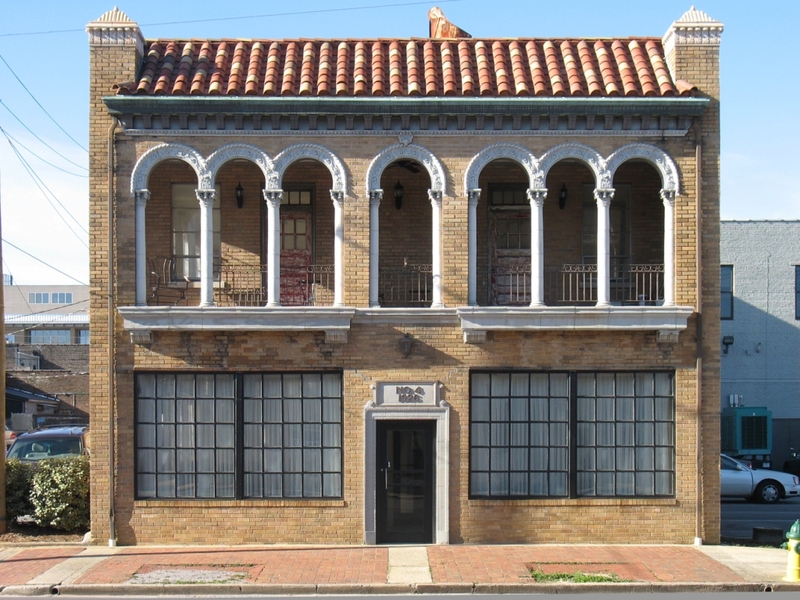 12 in Woodlawn, now used for Church of the Highlands outreach programs.